I’m not quite sure where to start in talking about these preserves. The flavor of them blew my socks off with the first bite. They’re delicate, yet tart and perfectly sweet, with a hint of champagne to make you feel extra fancy while sitting down to your breakfast. Or, in my case, running out the door with an English muffin slathered with preserves and butter, all wrapped up in a paper towel. See? I told you – fancy. In my head these preserves are a marmalade, but I always get confused about the differences between jams, jellies, marmalades and such, so we’ll go with the official “preserves” because, well, they’re preserved. 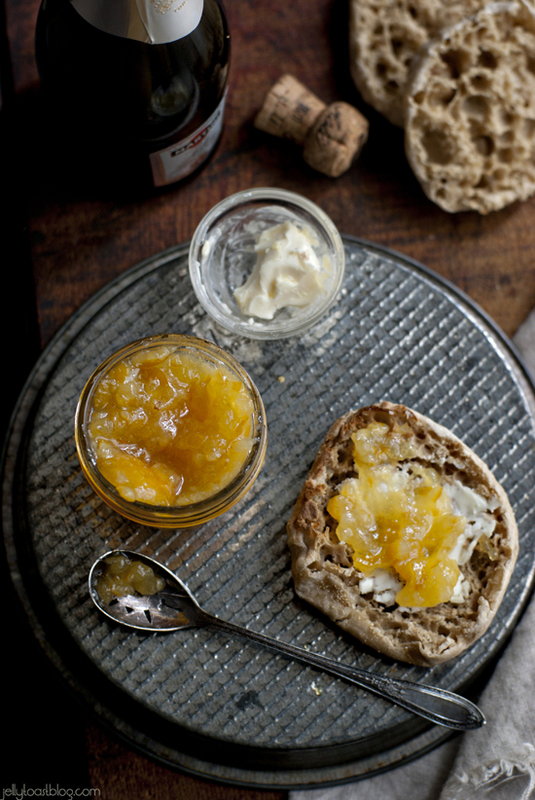 I have to say my current fascination with a fancy breakfast complete with these stunning golden yellow Meyer Lemon preserves and a cup of proper tea comes straight from my obsession of late: Downton Abbey. I mean, seriously, I can not get enough of that show. I lose myself in it. Swoon at the romance. Gasp at the crazy. They’re just so fancy and proper and so ridiculous at the same time; I love every second. Now don’t worry, you won’t find any spoilers here, as I have only just finished season 2 and will begin to catch up on season 3 tonight (I can’t wait, I can’t wait, I can’t wait). I have also been avoiding any Facebook or Instagram posts regarding the current season as to not ruin it for myself. On that note, please oh please if you love the show too, throw me a bone and don’t ruin any big surprises. Pretty please? 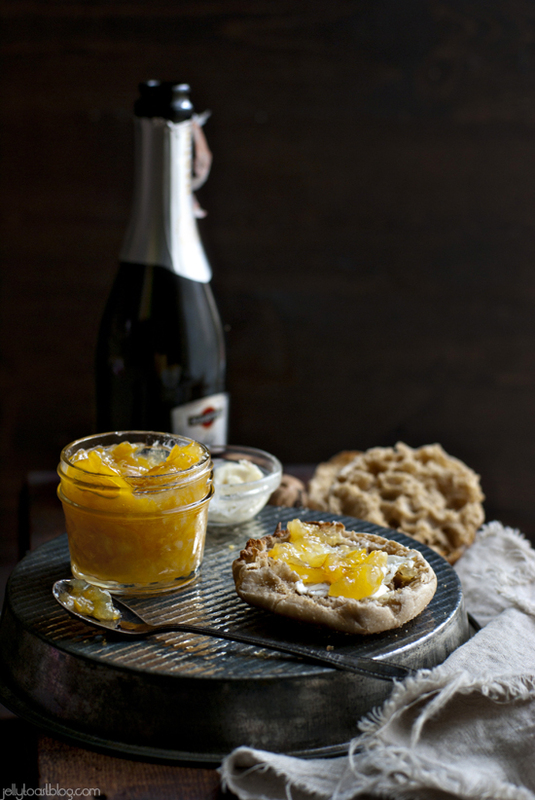 In exchange for your courtesy, I will share with you the recipe for these lovely Meyer Lemon Champagne Preserves. Okay, I was going to share it with you anyway, but just know that I’m grateful for your discretion on these matters. Oh, by the way, I’m speaking this entire post in a British accent in my head. You should do it, too. Come on, it’ll be fun. I know I’ll do what I always do with a new show, immerse myself in it until I’m out of episodes and then mope around my house for a few days wishing I could watch it all again. Classic me. It’s going to be a problem. Anyways, back to the marmalade, er, preserves and me having problems. Full disclosure: I completely messed up the first batch of these preserves. Take a look at the photo below and see if you can see the difference. Yup, that caramel colored dollop at the top would be my first attempt at these. They say a watched pot never boils, but I say an unwatched pot will burn the junk out of your preserves. Use my mistake to your advantage. Watch your preserves and please, whatever you do, don’t cook them on too high a heat. 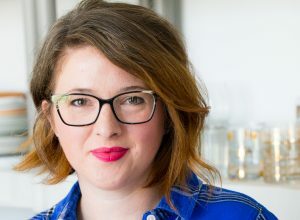 I cranked it up to Super Boil and walked away – probably to day dream about the Crawleys or something – and when I returned, the whole batch had, well, caramelized. Woops. 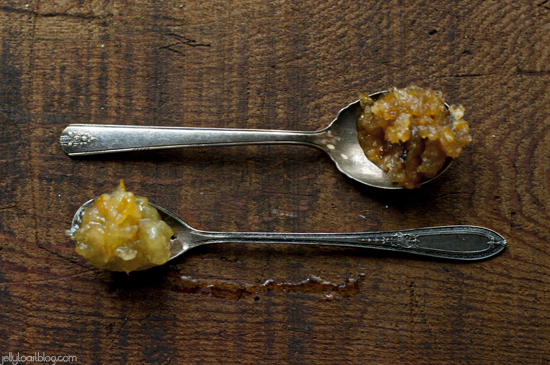 The second batch was a success; a golden beautiful pot of delectable sweet, tart preserves. Absolutely lovely. I couldn’t get over how pretty they were (especially in comparison to the first ugly duckling batch). As far as the first batch goes, I held onto it, because the flavor was actually still quite nice, but the texture and color were not appetizing. I am determined to come up with something to do with it (salad dressings, glazes for meats, etc) because I just hated to throw it away. I’ll keep you updated on that, though. As far as storing the preserves, I decided to not tackle canning as I was feeling rather lazy. I’ve canned before, but only a handful of times, and I realize it is something that I really need to gear myself up for, and I just wasn’t feeling it the other day. Plus, this makes a rather small batch; nothing that my family won’t inhale in a couple of weeks at the most. What I did do was sterilize a few jars in boiling water, pour in the preserves and then pop the jars into the fridge. They will last beautifully that way for about 2 months. I think even Mrs. Patmore would approve. Thinly slice Meyer lemons removing seeds and stems. In a no reactive pan, place lemon slices and cover with cold water. Bring to a simmer and cook for 10 minutes. Drain off water.Repeat this step one more time. Allow lemon slices to cool for several minutes. Place lemon slices in a food processor and pulse several times to break up pieces. Leave the pieces as chunky or as fine as you desire. Using a kitchen scale, weigh the lemon mixture. Return mixture to the large pot. Add the same amount of granulated sugar as you had lemon pieces (weigh the sugar to the exact same weight). Add sugar to the pot with the lemons. Add 1/2 cup of lemon juice, and 1 cup of champagne to the pot and bring to boil. Allow to boil over medium/high heat (taking care that the heat is not too high or it will caramelized your preserves) until the preserves reach the gel point (220 degrees on a candy thermometer). This will take about 10-15 minutes. Watch the preserves carefully. Gel point can also be tested by placing a small amount if the finished preserves on a frozen plate. If the preserves thicken and wrinkle when you run your finger through the Dan on the frozen plate, it is done. If it remains runny, continue to cook for several more minutes. 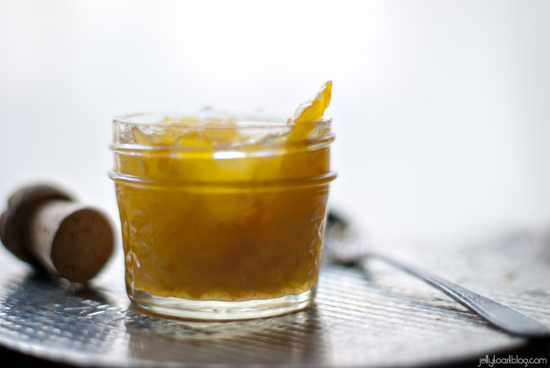 The preserves can be stored in sterilized jars in the refrigerator for up to two months. 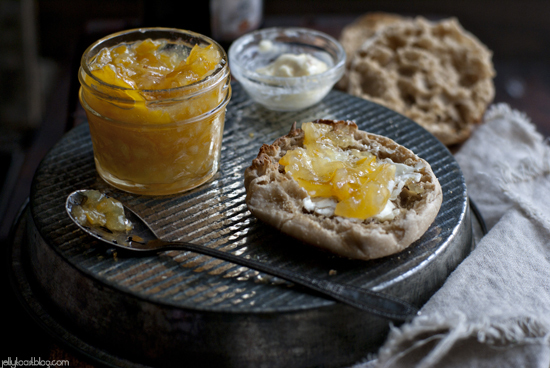 Serve on toast, scones or English muffins along with a smear of sweet butter for a perfect breakfast. Even though I don’t drink alcohol, I knew I had to click over just to drool over your shots. It’s never been a bad decision yet! Thanks, Loretta! You could make this with water and juice instead if you wanted to try it. Or even a sparkling grape juice might be nice, too! I have GOT to find some Meyer Lemons! Your posts are killing me, and that is stunnnnnnning jam. And I’m so glad you’re on the Downton train. It took me one season to get into it, and catching up on Season 1 a week before Season 2 started was the greatest thing ever. I had to hold myself back from using a BBC iPlayer hack I found to be able to watch season 3 early. I love your use of the back of cake pan for this shot. Very nice! 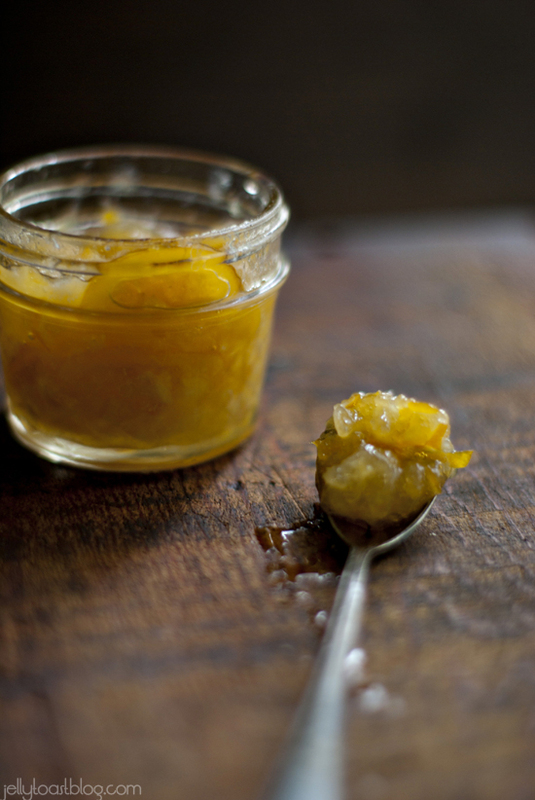 I made meyer lemon ginger marmalade and they were awesome. Now I want to try this one! What a beautiful set of photos, and this recipe looks divine. I made a blood orange Prosecco jelly recently and it was absolutely lovely. Must try this as Meyers are one of my favorite ingredients! Cheers! Gorgeous photos (especially the first one – so much atmosphere); The writing is awesome and the recipe is right up my alley! Stunning!! Can this be done in a water bath canner for ten minutes to seal the jars? I want to make this for bridal shower favors. We’re throwing a champagne brunch with mimosas and this would be the perfect party favor! !